PC gaming has been one of the bright spots in the rough computer market the past few years. Mobile gaming is also on the rise as technology continues to improve the performance of laptops. 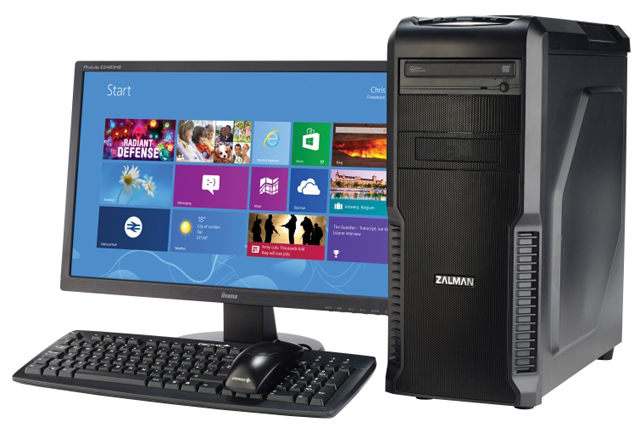 The issue is that laptops still cannot match the performance of traditional desktop systems. It has gotten butter especially for the larger gaming systems but consumers are starting to want smaller and more compact laptops. The problem is smaller systems mean less space for the graphics solutions and the batteries required to run them. This ends up contrary to the hardware requirements most gamers are looking for. In general they want to have the best performance possible with very high resolutions. In fact, many high end gaming laptops are shipping with 3K (2560x1440) and 4K (3840x2160) displays. This is where the external graphics solutions help solve a problem. Sure, mobile graphics can provide good performance for those willing to run their games at 1920x1080 resolutions or lower. but if you want to go any faster you need desktop class graphics. The ability to hook up a laptop system up with a desktop graphics card may make the systems less portable but provides them with desktop class performance when they are used at a home or location that you wish to bring the external dock or bay to. The idea of running an external desktop graphics card is not a new one. The conecpt was first really brought about back in the days when laptops offered the ExpressCard expansion slots. This interface in essence allowed the PCI-Express bus of the processors and motherboards in the laptop to hook up to external devices for expansion. By creating a docking bay with an adapter that plugged into the ExpressCard slot you now have access to a full desktop class graphics card. Of course, it wasn't that simple. The big problem was that ExpressCard solutions required an external PC display be hooked up to the graphics card in the bay. This may have been beneficial for having a larger display especially when most displays back then were 1366x768 resolution or lower. Requiring the external display made the graphics bay a little less portable. You might as well have gone with a small form factor gaming system as that offered better performance and was just as portable. Of course, Express Card did not catch on with many consumer laptops either. Manufacturers did not give up on the idea of external desktop graphics for laptop systems. Alienware is a great example of this with their Graphics Amplifier. This was similar to many early external docks in that it was an external box to hold a desktop graphics card but it had the advantage of not requiring an external display. This makes it a bit more useful for those looking to take their graphics with them as well. The drawback is that this is a system only works with certain Alienware laptops featuring the Graphics Amplifier. The dock is also extremely expensive at $300 without a graphics card. ASUS announced at the 2016 CES a GX700 laptop with a custom docking station. The large docking station would be equipped with a liquid cooling system and GeForce GTX 980 graphics card that would help provide it with high resolution graphics. The problem is that this system only works with the one laptop. At least the Alienware system could be used with multiple computers from the company. The system is also a bit less portable than some of the other external solutions because of the added bulk of the liquid cooling system. The advantage was that it provided a quieter system than most high performance gaming rigs. When Razer first announced its new Blade Stealth laptop, it seemed to go against the whole gaming focus of the company. The tiny 12.5-inch laptop that features either a 2560x1440 or 4K display only came equipped with Intel's integrated HD Graphics on the processor. This essentially meant that the system on its own was effectively an ultrabook without any real gaming potential. The different is that the laptop is really designed to be used with the Razer Core external graphics card dock. So, how is this different than previous propriety solutions? The Razer Core works using a standard Thunderbolt 3 interface using a USB 3.1 Type C connector. This gives it the potential to be used with any number of laptops and not just Razer's Blade Stealth. The key is the data bandwidth that Thunderbolt provides. With its potential for up to 40Gbps of data bandwidth, it can carry four times the data of USB 3.1 which is enough to drive two 4K displays. The Razer Core dock also offers additional USB 3.0 ports for adding additional peripherals and a dedicated ethernet port critical for many gamers. It also functions as a power delivery system for the laptop as well. While this may seem like a great open standard, there are still restrictions that people need to be aware of. The most critical of these is the requirement that the Thunderbolt controller has support for the external graphics standard or eGFX. Even if the Thunderbolt may support this, the motherboard BIOS and the software also have to. Even with all of this in place, the early implementations of the system essentially function like a PCI-Express 3.0 x4 slot meaning that the graphics cards will not be getting the full supposed bandwidth that a desktop system would provide. Razer is not the only company looking to product Thunderbolt based external graphics systems. More computer manufacturers are expected to start releasing laptops and even small form factor desktops that support the standards. Peripheral manufacturers are also expected to release their own external Thunderbolt 3 Graphics stations. This competition should be good as most of the early systems mention in this article carry a fairly high price tag. After all, spending $300 to $400 for a graphics docking station without corresponding graphics card can mean spending as much as building your own low cost gaming desktop system.